To be fully honest I wasn't totally sure about this book when I first received it in the mail from HarperCollins New Zealand. The main reasons were because: a) It is a middle-grade book and I usually don't like anything too plain like these unless it's by the exception of Stacy Gregg in which I will happily accept anyone of her books to read and keep. b) Because of the name and the cover. Yes I know that is a quick and harsh judgement but I mean come on, I'm not the biggest fan of cheesy titles and kiddy-ish looking books unless it has anything to do with horses or spiritual stuff. Basically I'm a really fussy reader (which is really strange because I'm not that fussy with other things but there are probably a million different foods I wouldn't eat even if you offered me a million dollars. Okay in that case, I wouldn't be that fussy. I need a new laptop anyway and the money would come in handy. I'll shut-up about that now). The cover is honestly the type of image that I would have seen as a kid and head off running in the opposite direction. It brings back the memories of being the weird kid that didn't read because all the books I found in my opinion sucked and my attention span was the length of my pinky toe. Depite the obvious and the fact that I do judge a book by its cover (the literal term) I do have a completely different opinion about the actual story. This book is about a kid named Al Chaudhury who is a quarter Indian and is basically best friends with his full Indian Grandfather, Grandpa Byron. His father died when he was eight from a piece of metal that was lodged up through his nose into his brain from a go-gart incident which eventually killed him and left Al to survive with his mother, and now at twelve years old, with a new step-father (or step-loser) called Steve and a step-sister (step-sister-from-hell) called Carly. Al has just celebrated his twelfth birthday with everyone and has finally received a very secretive letter that his father wrote to him before his untimely death. Al finds out that his father Pye was working on a time-machine project that involved his old Apple Mac laptop, a bunch of cords, and a zinc tub, all concealed in the safety of a cellar-turned-safehouse in his old house which is basically a while away from where he lives now. He has been instructed by his father to use this time-machine to go back to 1984, two days before the incident, and prevent this go-cart accident from happening and therefore saving his dad's life. Basically if the accident never happened, the metal that got shoved up his nose as a kid wouldn't be there as an adult to eventually kill him. Thanks to this, Al feels a responsibility to save his father and have a complete family once again. Not only does he need to attempt this in order to change history, he cannot tell anyone about it because they would either try stop him out of fear for his safety, or tell him that he is crazy and that it would never work. Despite everything, Al manages to find his way around but ends up finding a bunch of obstacles in his way and everything changing before his eyes in ways he could (almost) never explain, all while being accompanied by his pet hamster, Alan Shearer. * Again like the memoir thing, I love the "10 Things I Know About. . ." list! It gives the book some personality and I've never really seen any author use a list in a fictional novel before so it's pretty cool. Plus it gives a lot of quick insight to the characters that he is referring to, such as his Grandpa Byron, Mum, Dad or Steve. * How logical most things sounded but some confused me a little! I absolutely loved how the idea of time-travel and the fact that you couldn't travel to a time where you already existed. The way the time travelling worked using a computer and coding is so unique. The way his Dad explained the way it worked and experimented it. Though I noticed that some facts that were originally stated early in the book weren't thoroughly kept up with when Al was thinking of all the things he could do with time-travel, he mentioned going back a week to get a lottery ticket and winning it with the numbers he'd retrieved from that following week. But he wouldn't have been able to having been alive a week ago and he wouldn't have been able to travel to then due to that simple fact. 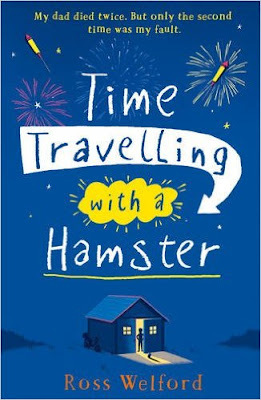 * The hamster was adorably cute and I think it helped make the story better! The fact that Al was galavanting around back and forth with time-travel with his hampster and having to look after it all the time was so cute. He worried about it constantly and lost it about twice but the fact that he made sure he always saved it was the cutest thing. Plus (believe it or not) we can't have hamsters here in New Zealand and so for some reason I imagine it to be the most adorable little critter ever and I had a rat once (it was an albino with red eyes so it wasn't ugly like some rats) so I totally get the little bond between owner and pet. Overall I have given this book a three out of five stars. I won't lie, it was a little boring for me mainly because it wasn't really the type of thing I was interested in and there wasn't a romance therefore I was at a lost for words when I finished it. However it is a great book for kids who are just starting out reading in middle school/intermediate and may be interested in the concept of time travel and computers. For a debut novel I think the author did a great job with writing this book and it will be nice to see what he writes in the future.